Keyboards and typing technology have come a long way over the past couple centuries. The first typing devices were designed and patented in the 1700s while the first manufactured typing devices came about in the 1870s. These machines featured “blind typing” technology, where characters were printed on upside-down pages that remained unseen until completion. Since then, we have seen several updates in design, layout, technology, and function that are more efficient and user-friendly. The type-writer has changed shape dramatically over the years, eventually becoming electronic- then practically obsolete as we moved into the age of computers and the birth of the keyboard. The keyboard is the number one computer interface used around the world, and an integral object for many of us that most people take for granted. This paper will explore the history of typing, detailing the innovations across time that have accumulated into the definition of today’s standard for the ultimate typing experience. To begin exploration of the first keyboards, we must first examine the origins of typing and the first typing devices. What did the first typing machines look like? The first manufactured typewriters resembled sewing machines more than what most people imagine when they think “typewriter.” Remington, who manufactured the first typewriters, were also manufacturing sewing machines at the time, leading to this initial design atheistic. The first Remington typewriters, created by Sholes, Glidden, and Soule even came with a foot pedal (like a sewing machine) to control carriage returns. So how did we get to where we are now, in the high-tech age of computers and plastics? To move forward, its important to first move backwards in time and see how these first commercially successful type-writers came to be. Technically the first documented typing devices predate the Remington’s Sholes & Glidden typewriter, though none of them were manufactured for commercial use. In 1714, the first patent for a typing machine was issued in London, England to Henry Mill. Though there is no evidence that the machine was in fact constructed, or sold, all we know is that this typing device was intended to prepare legal documents in a manner that was neat, legible, and in a standardized format. Fast forward to 1808, another typing machine was patented to Pellegrino Turri in Italy. His machine was intended to allow the blind to “write.” With Pellegrino Turri’s typing device, also came the first Carbon Copy. Pellegrino’s invention of the carbon copy has made a lasting impact on the modern office (carbon copies are still regularly used on triplicate forms, phone message and memo pads, sales receipts etc.). In 1829 William Austin Burt also created a writing mechanism, a “Typowriter” that instead of keys, used dials to print characters, making this process slower than handwriting to produce words on a page, but it was a way to print legible, uniform text. The typowriter was also created with the intended use for the blind. A later model of the typowriter, created by John Jones in 1852 is pictured below. None of these devices gained much public interest, or commercial success. From 1829 up until 1870 there were many other typing devices that were patented along with the ones mentioned above, and like the previous devices none of them went into commercial production, or mainstream use. The only ones worth mentioning, for the sake of being extraordinary were Father Francisco Jaâo de Azevado’s “homemade” typewriter made from wood and knives in Brasil (1861), and Denmark’s Hansen Writing Ball (1865), both pictured below. Father Azevado’s typewriter is arguably the first “typewriter” as the mechanism is the most similar to the commercial models that followed its inception. It was completely constructed of household materials which makes it particularly interesting and impressive. Brazilians argue that his invention should be credited as the First Typewriter. Moving across the globe to Denmark just a few years later, The Hansen Writing Ball was invented by Reverend Rasmus Malling-Hansen, in 1865. The half-sphere shape of the ball is unlike any other typing device before or after it, and regardless of visual appeal, The Hansen Writing Ball actually gained quite a bit of attention in Europe and England as a fully functional typing device. It is documented that Hansen Writing Balls could be found in operation up until 1909 in many offices and businesses in England and Europe. Because of the relative success of this product, Malling-Hansen released a few different versions of this invention. His first Writing Ball began as an electric device, but later he released the “Tall Model” in 1875- where no electricity was needed. The fact that it no longer required electricity resulted in a broader range of consumers in various rural and urban locales. Soon after the the Hansen Writing Ball’s creation, Sholes (an Inventor), Glidden (a Mechanic), and with the help of Soule (a Printer) came along with their 1867 type-writer that changed the world of typing as we know it. It is this “Type-Writer” that gave us the word typewriter, and is the model that is referred to as “The First Typewriter.” Interestingly enough, though this was the most successful typing device of that time, Sholes and Glidden were too frustrated by slow sales so they sold their patent to Densmore and Yost for $12,000. Machinist and clock-maker Matthais Schwalbach made the Sholes and Glidden typewriter in Milwaukee, and had Remington manufacture and sell it. Soon after this sewing-machine-like model was created and sold, the foot pedal was removed with carriage returns being controlled on the typewriter itself. Following this change, a slightly smaller, desk-top version of the typewriter came to be (though still extremely heavy and full of metal), losing the sewing machine look and defining its own look as a typewriter. By 1910 all typewriters were more or less standardized, sharing very similar resemblances across the board, until the IBM Selectric was introduced in 1961. The Selectric typewriter, no longer used type-bars that struck the page. The Selectrics used typeballs (resembling golf balls) that rolled, tilted, and printed the letters on the page without the typebars. This was huge, because typewriter jams (when two typebars interlocked if you typed too fast) were no longer an issue. This increased typing speed, and efficiency. The other new element brought to the typewriter scene with the Selectrics was that the typeballs could easily be taken out, and replaced with others to change fonts quickly on the same document. This was also a major advancement in the industry. Though the Selectrics were still quite heavy, large, hunks of metal that were difficult to move around, the typeballs were small, easy to move, accessories that gave typists more freedom and accessibility. The Selectric Typewriter was produced up until the 1980s with three models that evolved over the course of those decades: The Selectric I, The Selectric II, and The Selectric III. They were available in a variety of colors including: vintage blue, mossy green, burnt red, beige, and black. The typewriter has come a long way over the years, all leading into the age of computers and the most widely used input device: the computer keyboard. Though the first computers and computer keyboards were created before the Selectric, these power-house typewriters were so great at putting text on the page that they continued to be used alongside keyboards, as computers gained in popularity. Hunter S. Thompson was known to write on one, and some writers such as David Sedaris to this day still use and prefer their Selectric Typewriter. Typewriters have largely been replaced and taken over by the keyboard as the preferred, and most used typing device. A few years ago, rumors generated by the Daily Mail even went as far to publish that the, “Last Typewriter Factory Left in the World Close[d] its Doors” which as it turns out was an exaggeration, and false (as confirmed by NPR). Though the age of typewriters has faded and they have become more of a novelty than a necessity, several government offices continue to use typewriters to produce legal documents, which has kept and will keep typewriters in production, at least for the time being. While typewriters were widely used throughout the 1950s to the 1970s, computers were starting to emerge as a consumer friendly product, beginning the age of the computer keyboard as a primary input device. To understand the development of the computer keyboard, its important to understand the development and evolution of the computer. In 1946, the first computer, ENIAC was constructed and teletype was used to input data. As you can see below, the ENIAC computer took up an entire room, hundreds of times larger than the modern computer laptop. What was teletype and how is it different from from modern computer keyboard input? Teletype and ENIAC computers used cards (similar in shape to index cards) that were inserted into the Teletype while a series of holes called keypunches would be punched into the cards according to which keys were pressed on the teletype machine. After the cards were keypunched by the computer, they were brought over to a card-reader that would analyze the deck of cards as data (tangible memory). Early Computer Punch card. Courtesy of the Computer History Museum. In 1948 the BINAC computer used a different input/output method, with an electromagnetically controlled teletype to input data and print results. The BINAC is what paved the way for the shape of computers and computer keyboards to come, though it would still take a few more decades to move away from the teletype/punchcard computers. Another punchcard computer popular at the time, was the UNIVAC I, produced in 1951 is also pictured below. In 1964, Bell Labs and M.I.T. created the MULTICS computer, a time-sharing, multi-user system with VDT, a video display terminal. Text was instantly visible on the screen as it was typed, which made communicating commands, programs, and controls to computers more efficient than previous teletype methods of input. By the late 1970s all computers used VDT and electric keyboards. It was simply the most straight-forward and user-friendly method of interacting with computers (no stack of cards to punch holes in and keep organized). The first keyboards that were sold in the 1970s were all built from scratch, piece by piece, and were heavy as they were fully mechanical. Since so much time and effort was needed to create these keyboards, and since the target market was primarily computer programmers and engineers, they were built for function and not for visual aesthetics. This meant there wasn’t a keyboard cover or cabinet, making the keyboard more or less exposed. There were also keyboards that were built into personal computers at the time. In the mid-1970s Imsai and Altair created the first small PCs for consumer use, generally referred to as the S100 computer systems. These machines were built piece by piece, and provided the bare essentials. There were no hard drives or floppy discs on these first machines, so there was no way to save data on them. The keyboard was located on the front panel of the computer, as a set of key switches. If users wanted a standard keyboard, IBM sold a converted electric typewriter, but as supplies were limited and the product wasn’t in high demand many users had to convert their own electric typewriters if they wanted an easier to use keyboard to enter programming code. Additionally, a second keyboard had to be connected for data entry. It wasn’t provided with purchase, requiring that users had to build their own. 1970s Altair Home Office Desk Set-Up. Courtesy of the Computer History Museum. In the late 1970s Apple, Radio Shack and Commodore all had the foresight to see the large market in computer keyboards, and started manufacturing keyboards for their computers, paving the way for the modern assumption that all computers come with a keyboard, and that keyboards are the primary, standard input device. Below is a 1970s Radio Shack commercial for the TRS-80. In 1981, IBM released their first PC. In 1986, it came equipped with the Model M keyboard. This computer keyboard was wildly successful because it was so easy to use, users didn’t have to convert their typewriters or provide their own build of keyboard to use as an input device for their computers. The Model M was a mechanical keyboard, and used the highest quality construction, giving typists the satisfaction of tactile feedback, acute accuracy and comfort. The only draw backs on this keyboard was that the “Shift” and “Enter” keys were reportedly too small for the majority of user’s preferences. Because of this, IBM made and sold “Keytop Expanders” which fit over the shift and enter key-switches to expand the keys. All of the keyboards at this time were limited in that they were only offered in two colors: beige and grey, until the late 1980s when black was introduced as an option. In the 1990s membrane switches began to replace the mechanical key switch, as it was quieter, weighed less, and suited the needs of the new laptop generation. This was also an advantage for the manufactures because membrane keyboards were much cheaper to produce. Unfortunately the quality of the keyboard significantly dropped as these superficial keyboard aesthetics dominated (slimmer, quieter, lighter weight, easier to be mobile with). The technology and mechanics of these keyboards will be detailed in future chapters, and mechanical keyboard information can be found here: on our Mechanical Keyboard Guide. Here’s a photo showing the dramatic difference between early Apple mechanical keyboards (1983), and decades later the modern non-mechanical Apple keyboards (2010). 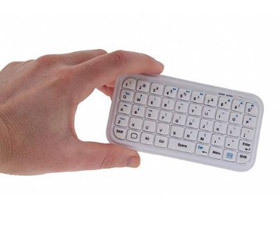 Other changes in keyboard design, whether or not improving upon function, have included the folding keyboard, the water-proof (and washable) keyboard, the keyboard that also functions as a mouse, thumb-sized keyboards (for mobile devices and travel) and virtual touch-screen keyboards. Over the years there have been several other designs that verge on science fiction- like the laser keyboard, the flying saucer keyboard, the jellyfish keyboard, and the fully-programable, lcd-key display Optimus Maximus Keyboard. Its mind-bending to see the evolution of keyboards in terms of where they started as teletype machines and typewriters- to where they’ve evolved into all the options we have quite literally at our fingertips. Jellyfish Keyboard. Industrial Designer: Erik Campbell. Inventor: Doug Engelbart. Keyboards come in all shapes, sizes, and colors these days, though it’s important to remember that without the original, simple, powerhouse mechanical keyboards of IBM we wouldn’t be where we are today. With all of the design innovations being manufactured, there is no surprise that many creative keyboard aficionados have started to emerge with their own inventive modifications to improve the typing experience and aesthetic. Richard “Doc” Nagy has taken his creativity, and craftsmanship to the next level in keyboard design and has built some very interesting and inventive keyboard mods that seem to have traveled back in time, with a paradoxically futuristic edge. From steam punk and art deco themed keyboards, to keyboards with scrabble tiles for keys, Doc’s modified mechanical keyboards are true works of art (and fully functional). Visit Doc’s site, Datamancer.net for his complete gallery. The most widely used keyboard layout is QWERTY, named as such for the positioning of the keys in the top left row. Christopher Latham Sholes and Carlos Glidden produced the first typewriter featuring the QWERTY layout in 1874 and though there have been minor changes over the past centuries, for the most part it has remained consistent. One of the differences of the original QWERTY layout from the current version was its lack of a “1” key, and consequently “!” key. Instead of typing the numeral one, typists would use the lower-case L (l). To type an exclamation mark, typists would use a period (. ), hit backspace, then type an apostrophe (‘) above it. Another key added in later versions was the “=” and “+” key. These symbols were used very infrequently on typewriters as it was generally assumed that Adding Machines were used to do all the mathematical notation. If typists wanted to produce a plus-sign, they would type a hyphen (-), hit backspace, then type a colon (:). When they wanted to type an equal sign, they would type a hyphen (-), hit backspace, and then type an underscore (_). At the start of the QWERTY layout, typewriters were only able to print UPPER CASE letters, as the “shift key” had not yet been introduced. At the end of the 19th century in 1894, The Duplex full keyboard brought lower case letters to the typewriter by featuring separate keys for lower case and UPPER CASE letters. There were twice as many keys with this design which eventually lead to the invention of the “shift key.” The shift key allowed for a consolidated keyboard similar to the first models that only typed capital letters, as well as the use of both lower and uppercase characters with the same key. Additionally, having a shift key allowed the numerical keys to be shared with special characters such as the ampersand (&) and percent (%) signs for further keyboard consolidation. One problem that arose after the shift key was added was that holding down the shift key to type more than one letter at a time was particularly difficult on early typewriters. This lead to the “SHIFT LOCK” key, later to be renamed “CAPS LOCK” by modern typists. Shift lock allowed typists to switch back and forth between lower and upper case characters, as well as numerical andspecial characters with ease. QWERTY layouts were developed as a means to slow typists down. In the beginning stages of the typewriter, people typed so quickly, that they often jammed the keys as they flew up to hit the typewriter ribbon. To prevent this, QWERTY was born to decrease typing efficiency and speed. This is why, rather than placing the most commonly used letters in convenient, central, finger placements, they are instead found in awkward locations, like the “A” key under the left pinkie finger. Likewise, the less commonly used letters are placed in the prime areas of the layout. Notice, for example how the “J” and “K” keys are under the right pointer and middle fingers. With these inconvenient placements, more than 50% of keystrokes take place on the top row, and roughly 30% take place on the bottom row. That means that less than 20% of all keystrokes actually occur where your fingers are centrally placed, the row commonly referred to as “home row.” So if this layout is so inefficient and awkward, why are we still using it today? The QWERTY layout has stuck with us for the past century for two reasons: it was the first established layout that everyone grew accustomed to and accepted; and when computers began to come into play, the leaders in the computer keyboard industry opted to keep the QWERTY layout on their manufactured keyboards- effectively binding generations of typists to an inefficient layout. When IBM and the other major manufacturers chose to stick with QWERTY, everyone else followed their lead. Thus they established the standard in layout design for decades to come- regardless of how inefficient and outdated. The QWERTY model keyboard is still used today by some of the world’s fastest typists, but imagine how much faster and more efficient typing could be if the keys we use most often were under the strongest of our fingers in the easiest to access areas. That’s where Dvorak comes in. The Dvorak simplified layout was introduced in 1936 by Dr. August Dvorak, and offers a keyboard layout that is more intuitive and efficient for modern typists. Dr. Dvorak conducted extensive research on the English language (and other languages using the Roman alphabet), and studied the physiology of the hand. Dr. Dvorak’s research brought forth not only the Dvorak layout, but also two additional keyboard layouts designed for people with one hand: one keyboard for those with only one right hand, and the other for those with only a left. These single-handed keyboards allow one-handed typists to easily type 50 WPM. If he was able to design a keyboard easy for one-handed typists to use, imagine the functionality and efficiency possible for two-handed typists. On a Dvorak keyboard, all of the most commonly used characters fall under the “home row.” He placed the vowels: “A,” “O”, “E,” “U,” and “I,” under the left hand; and the letters: “D,” “H,” “T,” “N,” and “S,” under the right hand. In addition to the awkward placement of common letters, the QWERTY design also requires the same finger to type common letter combinations, and the same hand to type common words. All of these elements aided in slowing down typists, to limit typewriter jams. Dvorak noticed this speed bump, and took it into consideration for his simplified layout, where the same finger or hand aren’t required to type all of the characters in frequent letter-combinations and words while the other fingers or hand sit idly. The simplified Dvorak layout was slightly modified and adjusted over the years and finally solidified in 1982. The design requires less finger-motion, which both increases typing speed and reduces finger strain. It is also supposedly much easier to learn since the characters fall in less awkward positions, and the most common letters are all lined up next to each other on the home row. Dvorak layouts never overcame the popularity of QWERTY layouts, even though Dvorak is compatible with almost all modern computer models (including Mac OS X, Microsoft Windows, Linux, and BSD-UNIX). This goes to show the power and control that comes with simply being the first. In the eyes of the vast majority of the typing public, it’s “easier” to use the more difficult, and strain-inducing layout rather than start anew with something better. No matter how poorly QWERTY translates to modern typists, for many of us, it’s our “first language” and learning a new language takes a lot of time, dedication, and studying. The third most popular keyboard layout after QWERTY, then Dvorak, is the Colemak layout. Though this layout hasn’t reached as much of a fan base of the first two, it has gained some notoriety. Because only 17 keys differ from the QWERTY layout, this keyboard layout is fairly easy to relearn after years of QWERTY use. This has helped the Colemak layout to gain a following amongst typists who no longer want to adhere to an outdated QWERTY mode of typing, but are frustrated with the learning curve involved in readjusting to the Dvorak layout. Colemak is named after its creator, Shai Coleman, though Shai decided to match the last two letters to the Dvorak layout namesake (hence, Colemak), to perhaps appeal more to the alternative keyboard layout seeking community and draw some similarities between the two. This is the youngest of the three layouts discussed, though layout designs and updates continue to be tested and developed on a regular basis. Due to the popularity of the three layouts discussed, all other options receive little to no recognition or public attention. The main focus of newer alternative keyboard layouts tends to be an emphasis on mixing the familiarity of QWERTY with the efficiency of Dvorak. Who knows what will evolve in the years to come, only time will tell. Do you have a suggestion for a topic you’d like us to cover? Please comment your feedback, thanks for reading! Please stay tuned for the next installment. John James 1852 Mechanical Typowriter. Thank you Uwe, I have corrected! 🙂 Thanks for reading. Perhaps you can address the QWERTY layout of the keyboard in a future section? It is definitely addressed in a future section. It’s in progress as we speak. Slight correction on the photo of the modern Mac keyboard vs. older Apple model: the older keyboard is from an Apple Lisa, not a Macintosh. Original photo is here: http://www.flickr.com/photos/blakespot/2384298079/ and ought to be attributed under its Creative Commons license to Blake Patterson. I don’t think the 2010 Apple aluminium keyboards are ‘membrane’ keyboards. They are low profile laptop style ‘scissor’ keyboards. Jayson and Jhiggins, I appreciate your feedback, I’ll research more and revise 🙂 Thanks for reading! That is wonderfully written. Loved reading it. Very few people might know about keyboard history. Histories of Keyboards concentrate on the main Alpha Numeric layout but there are USA and UK English Layouts . One difference is the ” and @ key positions are reversed plus a few other changes . Why did these happen in an otherwise standard layout . hellow to everyone,i have to tell you something,,”,what key in the typewriter which is not found in the keybaord”??? My typewriter has a handful of keys that are not on my IBM Model M keyboard. These are: 1/2; 1/4; 3/4; Euro symbol; Cent symbol; M.R. key — not used because a computer doesn’t have the end of the page. My typewriter is a Remington Letter-Riter that I found in a junk pile. My keyboard is an IBM Model M from 1993 that I have mapped to the Dvorak layout. Sorry for the delay in our response. Just wanted to let you know that we are working on getting you this information as soon as possible. The date is wrong on the IBM Model M keyboard. 1984 is the copyright date. The manufacture date is between 1987-1992 approximately. Each keyboard label would show the exact manufacture date. Thanks for letting us know! We will fix this asap. Although typewriters are perceived as “useless” in the modern days, back in the days when there were no electronic, these things are perceived as innovative technology, similar to how we see Google glass, electronic cars, and etc. Maybe 20 years from now people might say “computers are useless” but it does not change the fact that these are historical artifacts that have gotten us to the modern society. Right, the keyboard which preceded the M was the Model F. Beamsprings preceded the Model F.
scissor switch keyboards still have rubber membranes. Very good written post. It will be useful to anyone who utilizes it, as well as myself. Keep up the good work – looking forward to more posts. I’m still learning from you, while I’m making my way to the top as well. I definitely liked reading everything that is posted on your blog.Keep the posts coming. I enjoyed it! are you guys ever going to add the sources? I’m writing up a thesis and need them sources, bois. Would people stop perpetuating the myth that QWERTY keyboards are designed to slow down typists? They’re not. There is only a marginal speed difference between the two layouts. In fact it doesn’t actually matter how the keys are laid out, in can be ABC or by letter frequency and it’s just down to training and how used to it you are.